As the developers of Tuff Brake Film, the #1 product used for preventing press brake die marks, we are constantly being asked if we could supply our film with an adhesive on it. Well here it is! 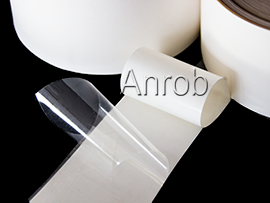 AR-14 Fab Tape is the answer for applications that require a self sticking, long lasting, abrasion resistant film. This tape can be used anywhere products are being marked or scratched by forming or fabricating equipment and a self adhesive product is needed. The applications are endless! � TENSILE STRENGTH: 140 LBS/IN. AR-14 Fab Tape is available in rolls 36 yards long, and widths from 1/2" to 48".